Wearable technology is increasingly popular for senior wellness management both in hospitals and in homes. These technologies, such as Tractivity and Hexoskin, are being developed at a rapid pace to meet the demands of Canada’s aging population. There is a market for wearables, however, there are numerous ethical issues that present themselves, not least because of the rapid development and deployment of wearable tech. Associate Professor Stuart Murray, the Canada Research Chair of Rhetoric and Ethics, addresses some of the important ethical issues surrounding the use of wearable technology: issues such as alienating language, presumptions in language and the definition of quality of life. Murray says the biggest ethical “red flag” is the effect wearable technology has on the way we think about ourselves. “If we think about biotechnologies, what is the bio? What is the life that is presumed?” Murray’s view is that if the purpose of technology is to service lives, then there must be a conversation around the kind of language that is used. Then, there must be a second conversation about the kind of life a person is living, the quality of life. Quality to one person might not mean a life that is extended, it might be a “short and heroic” life, Murray says. Murray suggests putting aside for a moment the virtuous qualities that technology brings us in terms of improved wellness, extension of life, making the quality of life better and so forth. One thing that concerns him is the effect this wearable has in making individuals think of their lives in instrumental terms. What would it mean to think of your body in instrumental terms, he asks. “It would mean to think of my body as nothing more than spare parts that could be replaced technologically, biomedically – and when the time comes, I will need a new part.” Is this really how we want to think of the relationship between ourselves and our bodies? The greatest challenge, states Murray, will be to have a more open dialogue and discussion about these ethical issues, the rhetoric, the concept of our bodies as instruments, death and quality of life. During a recent interview, Murray is intrigued to hear about an investigative journalism piece into the sustainability for wearable technology for senior wellness management. The discussion moves on to the technologies to be profiled, the relationship between wearable technology and health, and the views of doctors and healthcare professionals about how they implement and integrate the technology into their work. The discussion also touches on a common hope among technology developers that these innovations will allow seniors to remain autonomous, stay in their homes longer, and improve their quality of life. Murray explains that some of the language associated with wearable technology and senior care is alienating to this demographic simply because they are not familiar with these technologies. In addition, “innovation and healthcare” and “implementation of technology” are each terms that presume an instrumental relationship with ourselves and our bodies, says Murray. “This is only one way that we relate to ourselves and our bodies. But it’s not the only way.” To talk about wearable technology as a means to improve quality of life is an alien way to relate to our bodies and to think about what is health, he says. Not only are these terms alienating to seniors, but terms like “autonomy” and “privacy” also come with certain presumptions continues Murray. Murray goes on to say that “autonomy” is a predominantly Western phenomenon, but Canada is a diverse and multicultural society, therefore, there are numerous ethical issues with using this term. Murray says that in addition to the presumptions of language, there is a set of presumptions already built into the aging population. “Prolonging life is always supposedly a good,” Murray says. But there is an ethical debate surrounding the length of a life versus the quality of that life. “How do you measure that? Will technologies actually measure the quality of life?” Quality of life may mean different things for different individuals and seniors. Wearable technology has a “limited scope of application” and it probably won’t do a very good job about capturing the quality of someone’s life, Murray contends. As the Canadian government responds to the Supreme Court decision to decriminalize assisted dying, there will be many conversations about death and the right time to die. Murray argues that there is something about the “capitalist” thrust to biotechnology to improve and extend life that negates a discourse about death. “This is the kind of conversation that we need to have,” Murray says. AGE-WELL is a research program that is part of the Networks of Centres of Excellence. It is funded by the federal government and was inaugurated in 2015. Some 25 universities are represented within AGE-WELL. 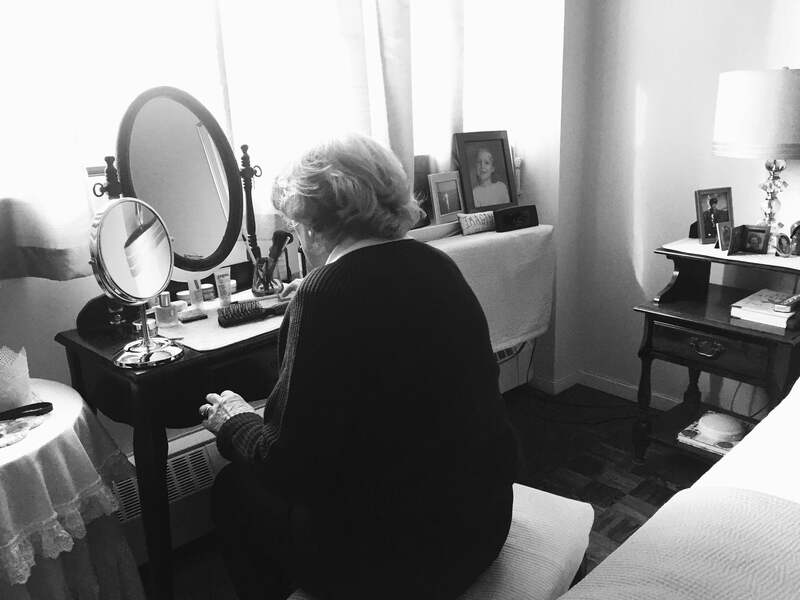 Each partner, researcher, and scientist affiliated with AGE-WELL, works on a project that is relevant to the development, commercialization, use and adoption of technologies among the elderly. Virginie Cobigo and Hajer Chalghoumi are AGE-WELL researchers. They are also both professors at the University of Ottawa. Cobigo and Chalghoumi’s project looks at the ethics of technology development use and adoption amongst the elderly. For the purpose of their research, Cobigo and Chalghoumi study those who are aging with cognitive impairment, those who have cognitive impairment after a stroke or brain injury, or those who have intellectual and developmental disabilities such as Down syndrome and autism. “What we are looking at is those who have cognitive impairment and how they can ethically use and adopt technologies to support their daily living,” Cobigo explains. Cobigo and Chalghoumi are in the preliminary phase of their study. They have spent the past year performing literature reviews to make sure that they are up to date with what has been published already. They assume that their study will take three to five years. The greatest misconception they have encountered to date is the assumption that seniors with cognitive impairments cannot use technology. “There is no reason that they are excluded,” said Cobigo. For their study, Cobigo and Chalghoumi are looking at many technologies. The first category of technology they are looking at is supportive communication programs. For example a communication device that instead of sending texts with words, sends pictures and photographs. They also intend to look at the use of devices that are used to help with travel and community, for example GPS applications on a smartphone. “That might be very useful for someone with a cognitive impairment who has trouble finding their way around.” The third application of technology they are examining are devices and apps which have the function to set reminders and list routines and steps for different activities. Much of the technology that is developed for seniors with cognitive impairments is developed specifically for them. Therefore, the user of that technology or device is labeled as a person with a disability. But a lot of people with cognitive impairment use iPads. Although iPads have applications tailored for individuals with disabilities, not every user of an iPad has a disability. The researchers contend that the labelling that occurs as a result of the association between technologies and individuals with cognitive impairments raises an ethical issue. A very big ethical dilemma is consent. “If you think about persons with cognitive impairment, consent is more challenging for them,” explaines Chalghoumi. Getting informed consent from some individuals is difficult. Everyone is different. One person may be open to wearing GPS shoes, another however may not, they may find the device too intrusive. Cobigo and Chalghoumi say that the object of their research is education development. They are hoping to educate both individuals and developers about the ethical issues that surround wearable technology. Cobigo and Chalghoumi explain that both the individual and the developer should have defined roles when it comes to the use of wearable technology. The individual – “You should be informed of the pros and the cons of using the technology, and make the decision that you feel comfortable with,” states Chalghoumi. This includes having informed consent of the user. The producer – At present, Cobigo and Chalghoumi say they have not yet been able to determine what the ethical responsibility of the developer of technology should be. It’s one of the objectives of their research. “We are working with technology developers and trying to understand their perspective and the struggle they have in developing ethical technologies,” says Cobigo. “It’s not that easy.” Technology developers generally become aware of ethical issues after development, or too late in the process of technology development. “Being smart from the start is compulsory,” says Chalghoumi. Both Cobigo and Chalghoumi say that it is important for developers to involve and include more persons with cognitive impairment in the development process. “This is one of the strengths of our project. It tries to put in comments and make collaboration an efficient collaborative network between the elderly with cognitive impairment, the technology developers and researchers,” states Chalghoumi. Ontario is currently changing its policy regarding what technologies are covered as assistive technology under the Ontario Health Insurance Plan (OHIP). The Ministry of Health and Long-Term care currently covers 8,000 pieces of equipment and technology under the Assistive Devices Program. Through the changes in Ontario law, devices like smartphones and tablets will soon be considered to be an assisted device, Cobigo predicts. Currently, individuals with disabilities have to use technologies that are labelled as “technology for the disabled” because other things are not covered, states Cobigo. “The research is very clear, persons with disabilities want to use technology that looks like the technology that everyone is using,” says Cobigo. The cost of these devices can also present an ethical dilemma. If the device, or wearable technology, is not covered by OHIP, then it can be quite expensive. If the technology is so useful, absolutely wonderful, might change lives, or improve quality of life for an individual, but it is so expensive that nobody can afford it – then it is not an ethical use of technology, says Cobigo. “That’s another thing that technology developers should have in mind or should be aware of,” says Cobigo. Persons with disabilities are amongst the poorest of our society, and they are generally the ones most often excluded from the use these technologies, even though in many cases, they would benefit from them most, states Cobigo. Through his studies, Chan has witnessed rapid development and widespread use of wearable technology and says that soon individuals will have to accept a new normal. PREVIOUS: The benefits and disadvantages of wearable tech. NEXT: Ethical issues are closely intertwined with privacy. Head to the next chapter to read about privacy issues.